Can you imagine having to look after seven dwarfs? Seven! That is a tremendous workload. Because it's not like these are seven cats, who basically take care of themselves (and would make Snow White the ultimate cat lady). No, we're talking about real people. And each one of them needs to be fed. Each one of them coming home after a long day in the mines and demanding dinner. And don't even think about the amount of laundry! Snow White is a saint for putting up with that at all for as long as she did. But what are you going to do when your literal witch of a stepmother has you playing fugitive for your perfect complexion and curly black hair? This classic princess wasn't a total pushover. She knew that if you clean a dwarf's house you give him a clean hut for one day. If you teach a dwarf to clean you give him a clean hut for a lifetime! Plus, she had plenty of woodland creatures to help her out. Where does a girl find those helpful bluebirds these days? Well, she had a pretty great uniform at least! 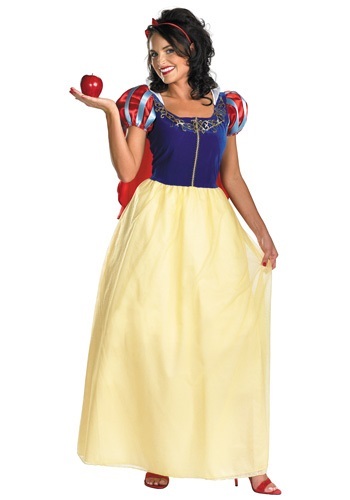 This costume features the classic royal blue, red, and yellow dress with a few lush details. The rich velvety bodice with gold trim would be more fitting for that crystal coffin nap rather than the everyday scrubbing. You'll attract the sweetest birdsong with the shining puffed sleeves and shining cape and long pale yellow skirt. Top it off with the sweet red bow and you'll be ready to head back to court. Just to be safe, stay away from those Red Delicious apples, they're more for show than flavor anyway!